DIY 3D Artwork – Wow! 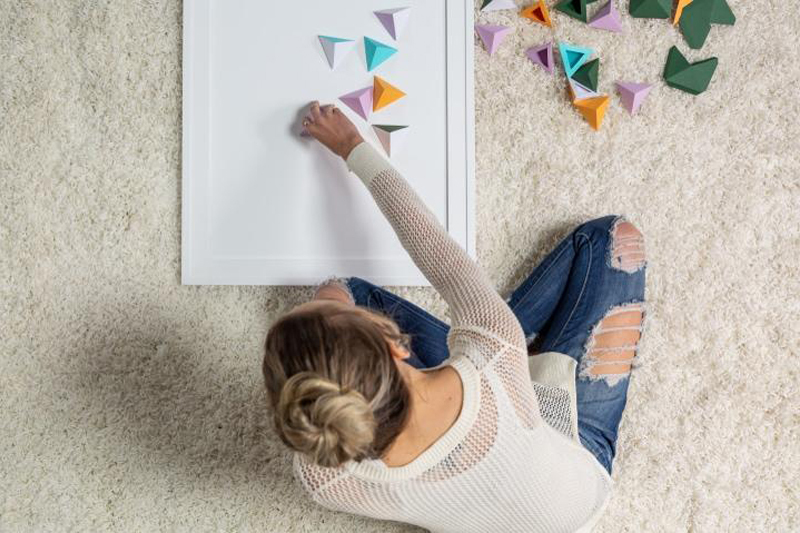 Learn how to make this amazing 3D Wall Art Piece. I don’t know about you, but no room is complete without some beautiful artwork that is meaningful. In my revamp of my craft room, the art piece had to be perfect. I wanted something that spoke to my personality and style as well as something that would continually inspire me to create. This art piece did all of those things for me. I love it so much and it’s such a fun and easy project that I had to share it with you. So let’s get making! 1: Score, Cut and Voila! Using my Maker has never been more fun! One of my favorite tools with this new machine is the Single and Double Scoring Wheel. They make anything from a basic card to this 3D art piece and cinch! To start off place one piece of white cardstock on your LightGrip Machine Mat lining your paper up with the outside grid lines. For me, it’s easiest to do this by lining up the bottom left corner of my paper with the bottom left corner of the mat’s grid. Once your cardstock has adhered to your mat, load your mat. Before you press “Go” make sure you choose the right cut setting. 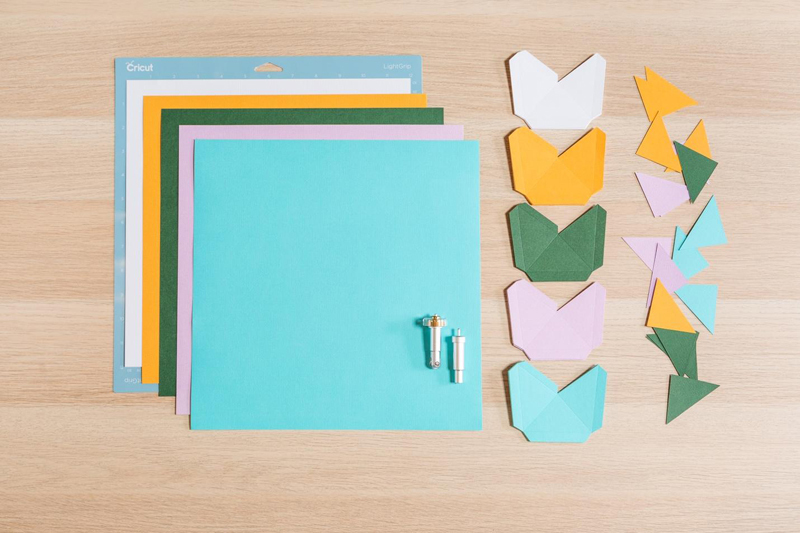 I selected “Medium Cardstock.” Switch out your Fine-Point Blade for the Scoring Wheel. Then press “Go” and watch the magic happen! When prompted, switch from your Scoring Wheel back to your Fine-Point Blade and hit “Go” one more time. Once your machine has finished cutting, unload the mat and carefully remove your pieces from the mat. Repeat this process for the remaining mats. 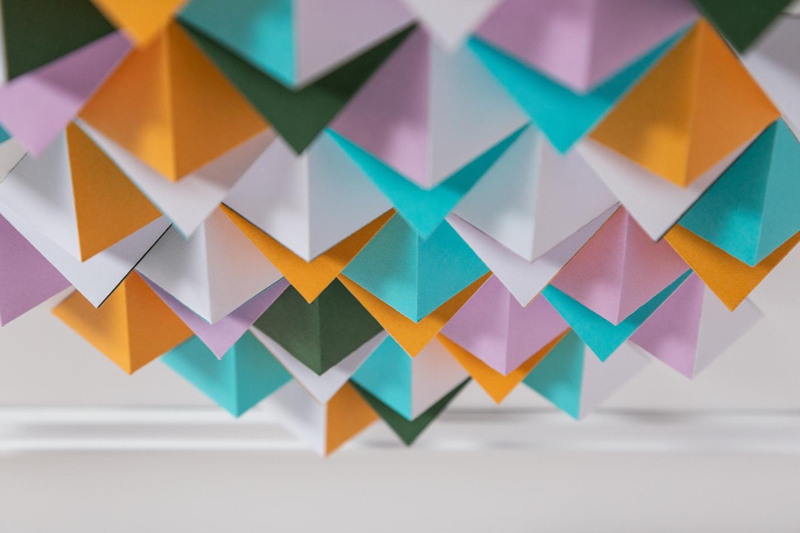 Once all of your pieces have been cut, it is now time to start folding. Fold along each scored line. For me, it was easiest when I folded the small tabs on each side first. Then I folded the crisscross lines. Fold each line inward and set aside. TIP: I like to have really crisp folded edges, so I use my XL Scraper Tool and press it along each crease so that it becomes a nice sharp point. 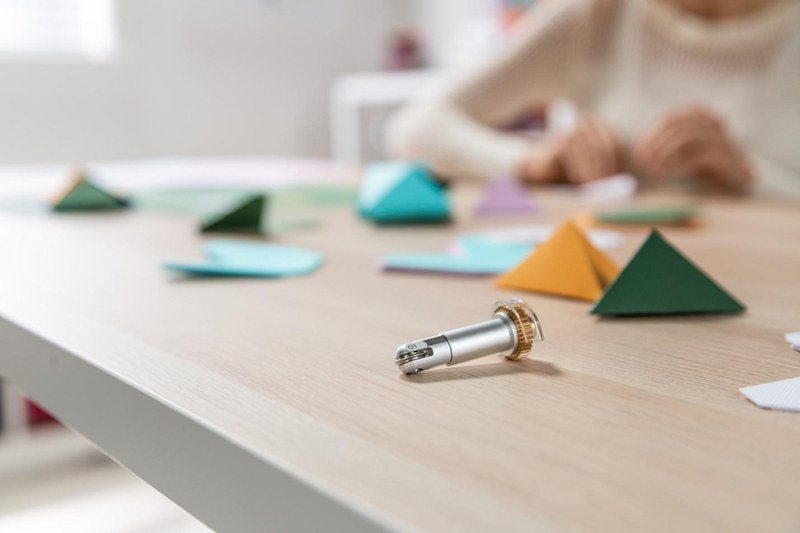 Once each piece is folded, place a small amount of hot glue on the inside tab of each piece and glue to the opposite side. This should form a mini pyramid. Repeat this step until each piece has been formed. 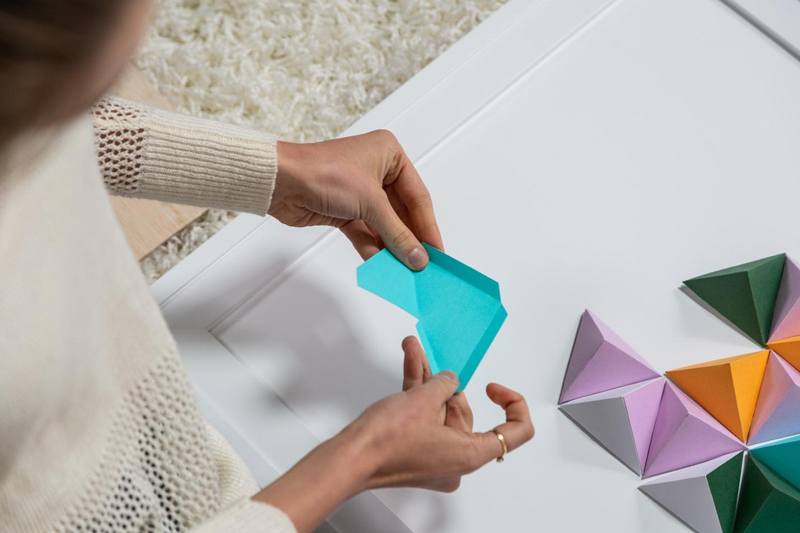 Take your colored triangle pieces and adhere them onto the white cardstock pyramids. I put only one colored accent piece per white pyramid, but you can be as creative with this as you’d like! Now for the most fun part which also happens to be the most challenging part…It’s time to arrange your art piece. Feel free to arrange and rearrange as many times as you need to till it feels like you have the look that you want. The fun thing about this project is that not each one needs to look the same-yours should be unique! Once you have your pyramids in the places you like them best hot glue them down. Start with the top pyramids and slowly work your way down. TaDa! You’re all done! See, I told you it was as easy as 1, 2, 3. And now you have a 3D masterpiece that is all your own! Be sure to tag us @officialcricut on Instagram and Facebook. I can’t wait to see how inspiring your art piece will be to each of us! Be sure to share this project with friends that you think might like making this project! I absolutely love this. I understand it all except how you made some pyramids with two sides white and one with a color. Or each side a different color. Hi. 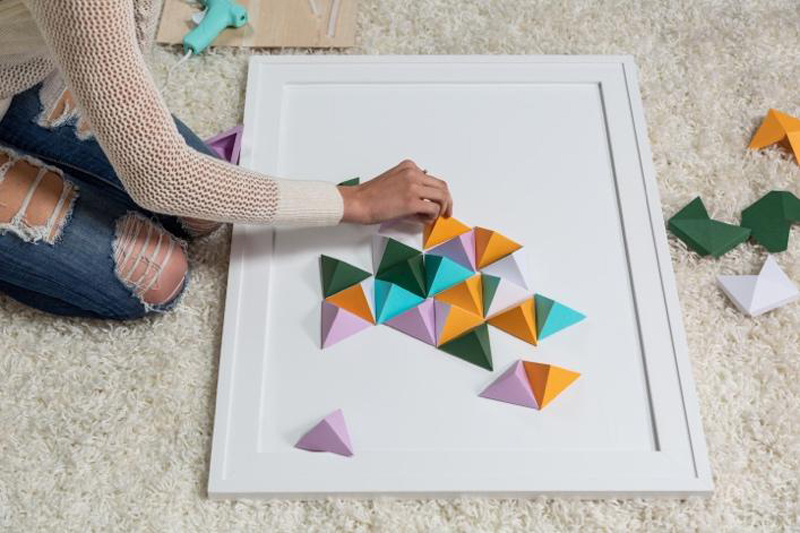 You control that during the glueing process; you can arrange the colors onto the sides of the white pyramids as you wish.